So my #FortyTen celebrations entered their fifth month (spoilt, moi?) and what with holidays etc this celebration had been scheduled as a post-holiday-blues-pick-me-up. Cocktails fell out of fashion for a while, seeing a brief resurgence when Carrie Bradshaw and the SATC girls drank Cosmopolitans at the Carlyle in NY but now they are back, with not only the traditional but new flavours and infusions. Mixology has become an art form and to learn about it is fascinating. We are not talking the syrupy happy hour version of cocktails here. This is an altogether more refined drinking practice. The choice of victual you drink from is almost as important as what goes into the mix. Teapots, teacups, copper beaker, crystal stubby, jam jars, schooners. The Harvey Nichols Cocktail Masterclass is the perfect girls day out, though boys will love it too (as did Mr H and his brother) and would be a great Hen celebration for those looking for something entertaining, educating and a little intoxicating. Be warned, I think phallic deely-boppers would not be welcomed at the über cool and sophisticated 5th Floor champagne bar at HN. The day starts at 9.30 with a breakfast buffet of pastries, yoghurt and granola and fresh fruit with plenty of tea or coffee. 9.30 on a Saturday or Sunday morning seems an ungodly hour to even think about imbibing alcohol but it doesn’t take long to get into the swing of things. There are several choices of class themes, Italy, Cuba, US, French and British each with three cocktails to be instructed on. 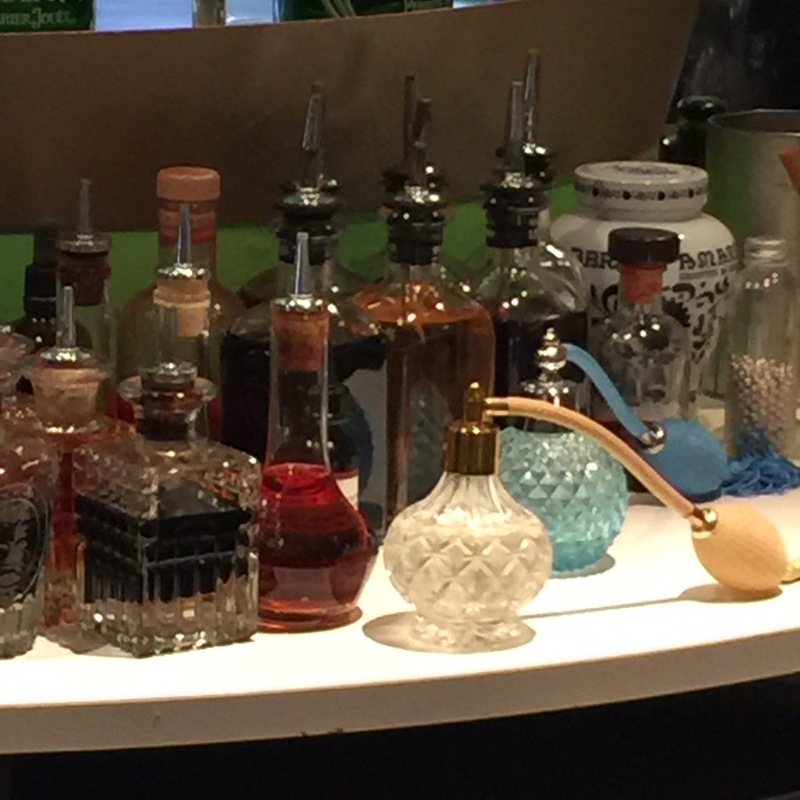 The class opens with a run through of all the equipment required to create the perfect cocktail. A muddler, strainer, cobbler, jigger … Each element has a crucial part to play in the making of your cocktail. First spirits are added into the shaker (never ice first for fear of diluting your precious alcohol too soon, nevertheless essential to ‘soften’ the alcohol) and finally your mixers, bitters or essences. An elaborate shake, with the length of time and ferocity dictated by the type of cocktail and your own personal choice in ostentation, you can keep it ‘tight’ and snake hipped or go all out Carmen Miranda. For example a Martini Espresso requires a LOT of quite enthusiastic shaking to also emulsify the ingredients and create a slight froth at the top – pour into a glass shaker to check all is well and the correct texture has been achieved before pouring into a chilled Martini glass and finishing with a couple of coffee beans. We chose the Italian influence for our masterclass so not only were we tutored in making the delicious Espresso Martini we learned to make a Breakfast Negroni; ( a traditional Negroni with a HN twist of the addition of a little marmalade to add texture and bitter-sweet finish to this Florentine classic and La Dolce Vita; an Aperol and Tequila cocktail again served in a chilled Martini glass. Following the instruction and tastings from our Italian selection we were given the opportunity to make our own cocktail from a list of favourites … Mr H made a delicious Mojito with lashings of fresh mint, his brother made a Ginny Hendricks – gin based deliciousness, the lovely Sue made a Cosmopolitan and I made a Sky Cruiser known in less salubrious surroundings as a Pornstar Martini … Vanilla Vodka, passion fruit and champagne – heavenly! Two and a half hours after starting the masterclass you are taken back to the restaurant with the effects of your imbibery making the path perhaps not quite as straight as your entrance, to enjoy a two-course lunch served with red or white wine. The masterclasses run on Saturday and Sunday throughout the year and can be booked here.